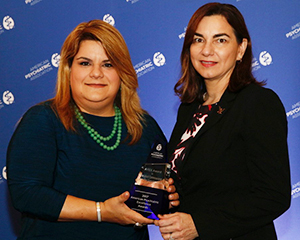 APA today recognized five leaders in politics, journalism, and advocacy for drawing attention to the needs of people with mental illness and substance use disorders during the second American Psychiatric Excellence (APEX) Awards presentation in Washington, D.C.
Honorees included Resident Commissioner Jenniffer González-Colón (R-Puerto Rico; pictured at left with APA Assembly Speaker Theresa Miskimen, M.D. ); Kathryn Farinholt, executive director of NAMI Maryland; U.S. Sen. Brian Schatz (D-Hawaii); U.S. Sen. Debbie Stabenow (D-Mich.); and Eric Eyre, a reporter for the Charleston Gazette-Mail. As resident commissioner, Jenniffer Gonzalez-Colon is the sole representative from Puerto Rico to Congress and helped secure $36.5 billion in disaster aid for the island in the wake of Hurricane Maria. “This money will be essential as communities clean up, rebuild, and work to recover both physically and mentally,” said Miskimen before presenting the award to González-Colón. Kathryn Farinholt helped develop the NAMI Family Support Group program, the “NAMI In Our Own Voice: Living With Mental Illness” training for NAMI representatives, and other signature NAMI programs. Sen. Brian Schatz co-sponsored the Expanding Capacity for Health Outcomes (ECHO) Act, which was enacted in 2016 to help expand telemedicine and telepsychiatry. He is also a lead sponsor of the Creating Opportunities Now for Necessary and Effective Care Technologies (CONNECT) for Health Act, which is also designed to expand technology-supported access to health care. The CONNECT for Health Act is endorsed by APA. Accepting for Schatz, who could not attend, was his health policy advisor, Amy Grace, M.D., a pediatrician. Sen. Debbie Stabenow has used her position on the Senate Finance Committee to protect “essential health benefits,” including mental health benefits, in recent efforts to reform or overturn the Affordable Care Act (ACA). She helped make mental health parity a priority in the ACA and has helped pass legislation to expand the health care workforce. Stabenow was unable to attend but her award will be presented to her at a later date. Eric Eyre is a statehouse reporter for the Charleston Gazette-Mail whose reporting has examined the opioid crisis in West Virginia and the role of pharmaceutical companies in distributing opioids in the state. He received the 2017 Pulitzer Prize for his reporting.